What do you do when you run out of contact lens solution? Can you use water in a pinch until you have time to run to the store? While it might seem tempting to clean your contacts with plain water, don’t do it. You could be putting yourself at risk for a serious eye infection or even blindness. Never clean your contact lenses with plain water. Plain tap water might seem like a safe alternative to contact lens solution, but in reality it is a dangerous choice. Water, even drinking water, can have various microorganisms in it, some of which can cause serious problems with your eyes. One microorganism, a protozoa known as acanthamoeba, has been known to cause blindness. This amoeba has been found in pools, lakes, rivers and even in dirty contact lens cases. Acanthamoeba is a protozoa found in soil and fresh water. It has been known to cause a serious eye disease called amoebic keratosis, a type of eye infection. The infection is very painful and has been known to lead to blindness. While anyone can contract this disease, it is much more common amongst contact lens users with 85% of cases happening to those that wear contacts. Plain tap water isn’t an acceptable choice for cleaning your contacts and neither is bottled water. Avoid using plain water, even if it has been filtered. Microorganisms can be present even in filtered or bottled water. Even distilled water has been found to have microorganisms. Contact solution contains special cleansing agents that can help to eliminate these microorganisms. Can I Wear Contacts in the Shower or Pool? You shouldn’t clean your contact lenses with water and you also shouldn’t wear your contacts in the pool or the shower. The same microorganisms that are found in water are found in pool and shower water. If water is splashed into your eyes while swimming you could have the same problems as you could encounter by cleaning your contacts with water. Water isn’t a safe choice for cleaning your contact lenses, but that doesn’t mean they shouldn’t be cleaned often. You should clean your contact lenses daily using an approved contact lens cleaner. Always wash your hands before handling your contacts and dry them using a clean towel. Follow all instructions provided by your eye doctor for properly cleaning your contacts. While the procedure can vary depending on the type of solution you use and the type of lenses you wear, most cleaners require slight rubbing or agitation of the contact lens to thoroughly clean it. Additionally you should clean your lens case each day with either contact solution or hot water. Cleaned cases should air dry thoroughly before using them again. Cases should be replaced often, but at least every three to six months. The FDA recommends throwing away all old solution after each use and filling the case with clean, unused contact solution. Never top off old solution with new solution and always replace bottles within the recommended time frame. With many different contact solutions on the market it can be difficult to choose one. If you need help your eye doctor is a great resource. They may be able to recommend a contact solution that will work well with your contact lenses. The manufacturer of your contact lenses may also have recommendations regarding contact solutions. Always follow the instructions that accompany the solution you purchase. Different types of solution require different cleaning procedures. If you run out of contact solution, go and get more. Don’t use plain water. Even bottled water can have microorganisms that can cause eye infections and permanent vision damage. Using contact solution and following the proper protocol for cleaning your contacts will help you to protect your eyes and your vision. 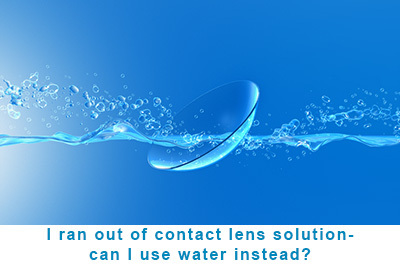 Do you use water instead of contact lens solution? Let us know in the comments! hi, thank you for the explanation..
i store it back inside the contact lens solutions. can i still use the contact lens? Contact lenses and water should never mix in my opinion you're asking for an infection. Don't store your lenses in water. Hi i wore contacts for the first time the other day and I didn't realise you are not suppose to use water to clean them, I accidentally rinsed them in water before putting them in the solution they came in because I didn't have an multi purpose solution at the time. I haven't worn them since after doing that. Now I have multi purpose solution are they damaged or can I disenfect them with multi purpose solution and wear them again I should I throw them away they cost a lot of money so I don't know what to do.